Folk Pool & Gardens, was originally an Instagram find, prior to us traveling to Bali. I'd loved the snaps of the pool lit up at night, but the I’d completely forgotten about the screenshots, until we had headed to up Ubud. I'd then found it again while scrolling through my phone, on our way up to Ubud, and knew we had to find some time to stop and make a visit. We took a taxi up from Canggu and after checking into our villa, and picking up a bike, we went out for a bit of a drive round. We had missed lunch, due to travels and it was almost time for dinner, so food (as usual) was high on the agenda! The perfect time to get in that visit to Folk! Using MapsMe we easily found the venue (it’s pretty much smack bang in the middle of the main Ubud town) and on our arrival were really impressed with our first glimpse of the pool and gardens. On first impressions, you wouldn’t even know the ordinary looking shop front, led to anywhere special. Only when you wander down the allyway and into the gardens is when you realise just what's out the back... a pretty little oasis, on an ordinary tourist filled street. As it was a Saturday, Folk were setting up for their fortnightly Popcorn Club, an outside movie screening, that happens every 2nd and 4th Saturday. It’s free which is even better! The pool and seating areas consist of comfy daybeds surrounding the pool, little tables chairs and umbrellas dotted alongside, as well as an under pagoda seating area. There's also the loveliest garden lounge, with colourful cushions and deck chairs that you can lay back on and enjoy a cocktail from their substantial menu. When we arrived it was fairly busy with swimmers and guests (that had most likely spent the day there, it was one of those places) but we were quickly escorted to a table by a smiley staff member. When we had settled into our booth, under the pagoda, we ordered some cocktails (it was still the 2 for 1 happy hour) as well as some dishes for dinner. On the Menu, there's a wide selection of Indonesian food, as well international dishes, an all day brunch and smoothie bowl menu, plus lots of offers. There's a Margarita Monday And a Mojitos Thursday (my kind of menus). Folk also have a small bakery where you can get fresh breads daily, made from locally sourced ingredients. 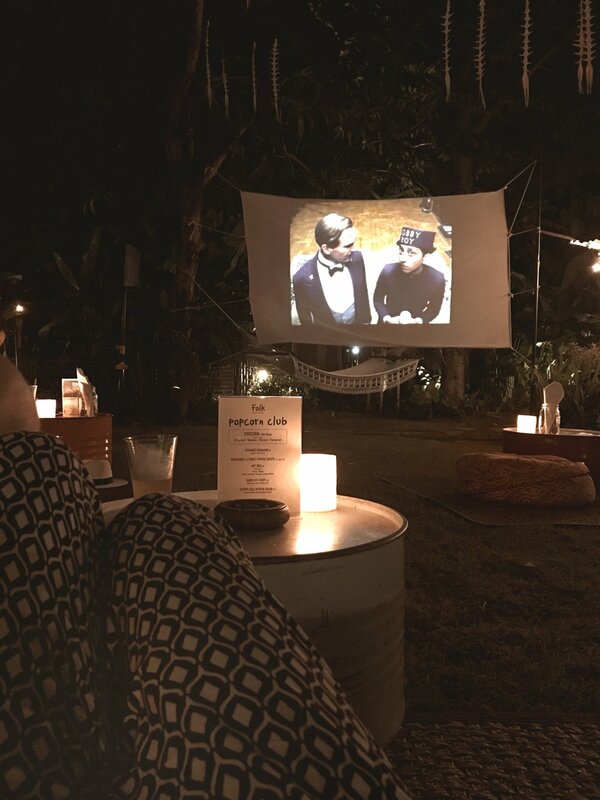 We didn’t get to use the pool on this trip, but we found out that the movie screening that night was Wes Anderson’s 'The Grand Budapest Hotel', so of course we had to stay for that. After a long day of traveling and moving, it was nice to sit back on the deck chairs and just relax away from the hustle and bustle and tourists of Ubud. (Sitting under the stars with your love is also something I can recommend). SPECIAL EVENTS: DJ performances & drinks promotions, outdoor cinema.